The Keep is an upscale Whiskey Bar and Restaurant in Downtown Lowell. Fresh twists on traditional cuisine from across the world - international comfort food,craft brews, cocktails and wines. Craft Burgers, craft cocktails, craft beer. A Chef-driven american restaurant. The freshest seafood boiled to perfection, drenched in finger-lickin’ good cajun sauce right here in Lowell. A dual menu of Thai & Vietnamese specialties plus a weekday lunch buffet are offered in casual digs. Since 1992 Beerworks has been brewing great beers and serving great food in a fun and friendly atmosphere. Casual Italian spot with a wraparound bar serving thin crust pies, burgers & red-sauce mains. Great food, great service at great prices in a cozy setting. Old-school family-run establishment serving traditional Greek eats since 1952. Cheery haunt with beamed ceilings, offering Irish & American pub grub, plus beer on tap & cocktails. Delicious Asian cuisine, including Thai, Cambodian and Vietnamese. Comfy venue serving eclectic Japanese & Chinese fare, including creative sushi, udon & Peking duck. Funky health-conscious spot, one of a small chain, serves organic, mostly vegan, eats & drinks. Part Mexican restaurant, part Irish pub, serving eats & drinks from both cultures in a cheery space. Tavern-style bistro serving seasonal American cooking & cocktails made with house-infused liquors. Historic gentlemen's club converted into this comfy venue, featuring American classics & craft beer. Lively, canal-side eatery serving Thai & Japanese fare (with sushi), plus specialty cocktails. 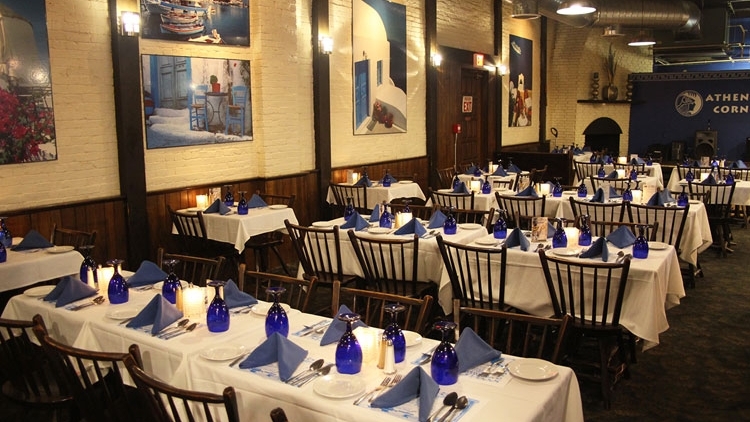 Festive, long-running restaurant featuring Greek fare & regular live music with belly dancing.